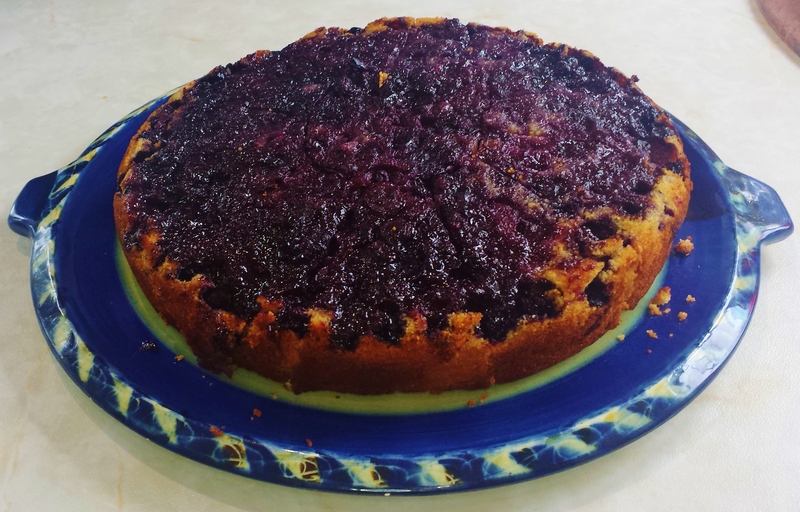 Easy Blueberry Polenta Cake is a lovely alternative to the traditional dessert. The polenta gives it a nutty taste and is lighter than you would expect. Step 2 Grease and line base and sides of a 9-inch square or round cake pan with baking parchment and then grease the parchment. Sprinkle the ¼ cup of sugar over the base of the pan and cover evenly with blueberries. Step 3 In a large mixing bowl combine eggs, ¾ cup of sugar and orange zest. Whisk until pale and thick. Add orange juice and oil. Whisk until blended. Step 4 In a separate bowl, whisk together polenta, flour, baking powder and salt. Add flour mixture to egg mixture. Whisk until smooth. Pour into prepared pan. Step 5 Bake for 45 – 55 minutes until golden brown and springy to touch. A toothpick inserted near the center comes out clean. Cool on a rack for about 5 minutes. Carefully invert cake onto a serving plate, and slowly peel off parchment paper. Serve warm or at room temperature.